Distracted driving, specifically texting and driving, is generally a new area of law and is largely untested in many courts in America. Texting and driving is a crime in 47 states, with more states moving to criminalize this dangerous behavior. To better understand the scope of distracted driving and the serious legal implications are associated with it, continue reading below. What Constitutes as Distracted Driving? The National Highway Traffic Safety Administration (NHTSA) defines distracted driving as any activity that diverts a driver’s attention away from driving. By any activity, the NHTSA means any activity besides driving. Fumbling in your purse for lip gloss, eating a burger, turning and talking to passengers, taking off your sweatshirt, or even simply changing the song on your phone could be distracted driving behavior. The most common types of distracted driving include talking and texting, daydreaming, eating, grooming, smoking, and adjusting music or controls. Kind of. For example, while it is not specifically illegal to eat while driving in many jurisdictions, if you become distracted while eating and driving thus causing erratic driving behavior, law enforcement could prosecute you for careless driving if they consider you to not be in full, proper control of your vehicle. Texting while driving, arguably the most common form of distracted driving, is regarded in the majority of states as a misdemeanor crime (Class B or C), resulting in a fine. Fines can range from $20 to upwards of $500 for engaging in this illegal behavior. If a car accident occurs due to distracted behavior, penalties can significantly change. A hefty fine will be added on top of any damages suffered after a distracted driving accident. Additionally, a law enforcement officer can add a reckless driving charge on top to increase the severity of the punishment. A distracted driver responsible for an accident resulting in bodily injury or death to another person could result in jail or prison time. The distracted driver may also face legal repercussions in a civil trial. Keith Furne, an Iowa man from Cedar Rapids, was charged with 10 years in prison and must pay more than $300,000 in restitution for a texting and driving accident that killed two teenagers and injured two others. It was his first offense. Majority of states consider texting and driving a primary offense, meaning a law enforcement officer can pull over a driver and give a ticket based off this act alone. In some states, texting and driving can constitute as a point on your driving record and contribute to “negligent operator” status, which could mean a loss of license. “Individuals accumulate points on their driving records when the DMV receives notification from courts and reports from law enforcement agencies that the driver was responsible for an automobile accident or committed a moving violation, a mechanical violation affecting safe driving, or a criminal driving offense,” notes San Diego criminal defense lawyer George H. Ramos. If you receive too many points on your license in a given period of time, you can have your license suspended. As for enforcement of other distracted driving behaviors, such as eating, these are usually secondary offenses. If you are driving erratically due to your distraction or your distracted driving leads to an accident or injury, you will receive a citation. Distracted driving is not only a serious threat to the safety of all other drivers on the road, but to you and your freedom as well. 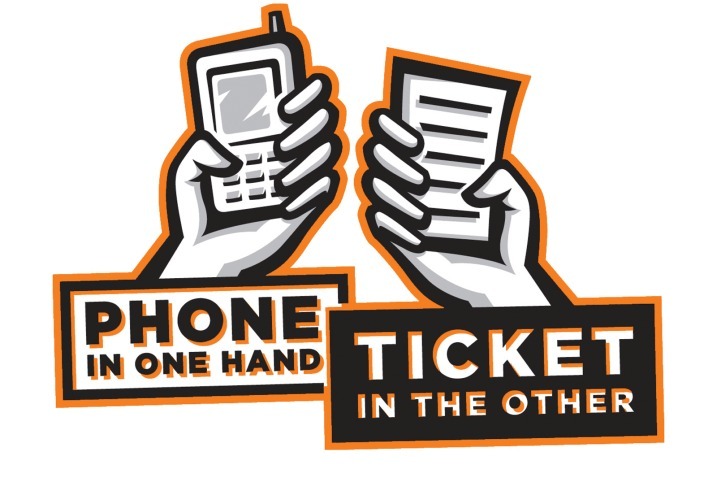 Choosing to drive distracted result in fines, driving penalties, and jail time, as well as an accident, injury, or even loss of life. Driving distracted is a choice. Don’t let it be yours. Choose to #JustDrive.